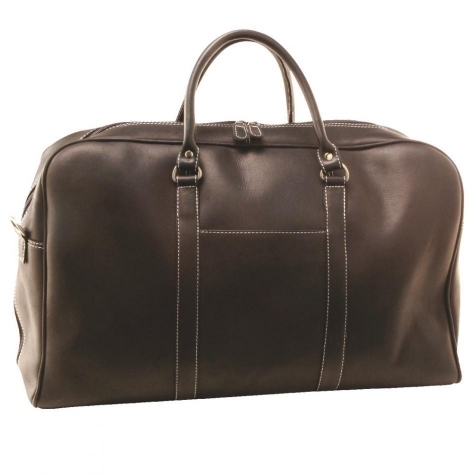 100% Leather Elegant Weekender features large fully lined main compartment w/ deluxe Organizer. Extended top zipper for easy entry to main compartment. Open slot pocket in front and in back for quick access to small items. Contrast (off-white) stitching adds visual appeal. Flat, firm bottom w/ protective metal feet. Adjustable, detachable shoulder strap w/ shoulder pad. Decorative vertical leather trim adds visual appeal. Shades of natural vary.